I wasn't watching much TV during the years Everybody Hates Chris aired, and I certainly wasn't tuning in for sitcoms. I hadn't seen a single episode of the show until we sat down to watch these four, and I had no idea what to expect. The title didn't fill me with confidence - it's odd for a TV show to so blatantly parody another currently airing. Without watching more episodes of this and Everybody Loves Raymond, I can't say for certain why Chris Rock chose to take such an obvious swipe at the competition up front. Raymond was a popular show, so Rock may have simply been after publicity. Alternatively, he may have liked the joke or objected to Raymond's somewhat idealistic portrayal of life in the five boroughs. 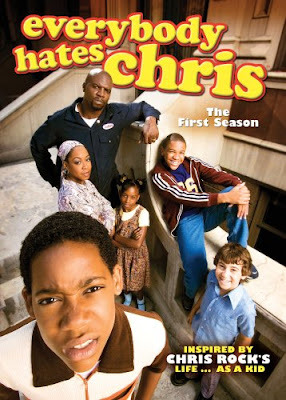 Whatever the reason, I think the name's unfortunate, since it connects Everybody Hates Chris to a far inferior show. This bizarre, quirky show deserves a legacy of its own. Or, at the very least, one tethered to Malcolm in the Middle, a contemporary program it far more closely resembles in both approach and quality. Both share a similar approach, sort of a surrealist impression of life through the exaggerated perspective of a child. The first of the holiday episodes is the least polished; it's also my favorite of the four we saw. The show has a somewhat manic, experimental approach. This sort of writing falls flat if the actors and direction aren't up to the task, but there's clearly talent on this at every level. This opens right before Christmas. Chris only wants one gift for the holidays: a Walkman cassette player. He's been dropping hints for months, so he feels relatively secure his parents are going to buy him one. He's right to be optimistic - his mother's planning to pick one up. But the Universe interferes when the water heater breaks. His parents call him in to explain that, because of that expense, they can't afford to get him a gift. Adding insult to injury, his two younger siblings will be getting Christmas presents. It's a rather absurd scenario, the sort of thing sitcoms do all the time, before resolving everything with some sort of deus ex machina or last-minute fix. This, however, plays it out. His parents make it up to him by letting him out of chores and making his life a little easier. There are a couple other plot lines going on. First, his brother spoils the Santa myth for their younger sister by showing her the room where his parents have the presents hidden. Second, Chris encounters racism at school when his well-meaning but hilariously naive teacher assumes his family is far poorer than they actually are. This thread, in particular, resolved hilariously in the closing minutes of the show, though it'd have been even more effective if they'd ended the episode about fifteen seconds earlier. The premise is nothing special, but the show's commitment to absurdity, alongside some phenomenal acting, sells the humor. It does a great job allowing you to sympathize with the characters while still enjoying every minute. That's not an easy balancing act. The second episode opens with Run DMC's Christmas in Hollis, which is always a good sign. But on top of the holiday cheer, Chris Rock's narration informs us there's a bad flu going around. I haven't said much about the narration yet. Strictly speaking, it isn't really necessary for the most part, at least in terms of plot. Most of the time, Rock is reiterating what's on screen or delivering a punchline that's more or less already been implied. It shouldn't work... but it does. Chris Rock is a master at comic timing and line delivery, which sells gags that would otherwise be redundant. On top of that, the narration adds some structure, providing transitions through quick cuts and brief asides. They also play up the point-of-view and make the surrealism easier to accept. That's true of all four episodes we watched, but it's especially relevant here, since not everything we see is necessarily real. Chris is clearly sick, though he lies to everyone - himself included - in order to keep earning money. He's had Christmas presents for his family on layaway for months, and he needs to finish paying for them. In addition to working in a corner store, he also picks up part-time work as an elf photographer for his father, who's playing the part of Santa. Things go poorly at the mall when his father challenges the greed of several kids and leaves them in tears. When the manager comes over to fire him, Chris collapses and wakes up in the hospital. It turns out he has walking pneumonia and has to stay for several days. While he's there, he seemingly interacts with a patient named Kris who berates him for complaining when others in the hospital have things much worse. On Christmas, Chris wakes up to find Kris gone, but the nurse denies anyone was ever with him. The role is played by Richard Lewis, who puts some real effort into the offbeat take on Kringle. He's only in a few short scenes, but they work well. At the end, his family comes to celebrate Christmas with him. His father even paid off the remainder Chris owed and got the gifts out of layaway. All Chris gets for Christmas is a bill for what he owes his dad, but he's happy anyway watching his family open their presents. This episode was the one that led to us coming across the show in the first place. I've wanted to throw in a few Kwanzaa specials for a while, but they're few and far between. Honestly, I'm not entire sure this even counts, as the Christmas elements are given equal time. It starts with Chris's class getting a homework assignment for winter break: each of them needs to help someone in need. Initially, Chris tries volunteering at a soup kitchen, only to find they're booked. Christmas, of course, is the one time of year everyone wants to pitch in. While he's there, he runs into a homeless man he knows nick-named "Kill Moves" who wants to find a Christmas present for his mother. Seeing an opportunity to complete his assignment, Chris offers to lend him a hand. Meanwhile, Chris's father learns that he's not getting a Christmas bonus. When he runs into someone promoting Kwanzaa, he sees an opportunity to avoid the costs normally associated with the holidays. The episode pokes fun at Kwanzaa and its creator, but also does a decent job providing a brief description of its history. Eventually, the narrative returns to Kill Moves, who - surprisingly - has a large quantity of money in a briefcase he keeps in his cardboard box (which, in true Time Lord fashion, is quite a bit bigger on the inside). Chris helps him pick out gifts: a Rolex watch and some chocolates, then they head to find Kill Moves's mother. It turns out she's wealthy and living on the Upper East Side. Oh, and she's played by Phylicia Rashad. We get some back story on Kill Moves and learn he's ex-military. After a mental breakdown, he became convinced he had to live on the streets. His mother respects this, but tries to keep track of him (she asks Chris to keep an eye on him). Before he leaves, she gives him another briefcase of cash. 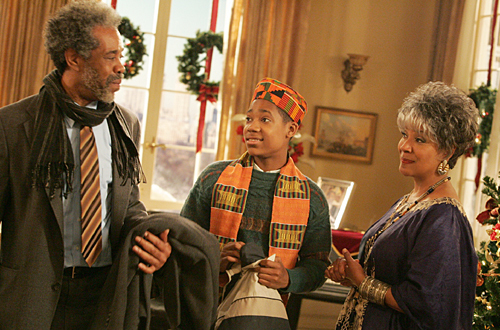 At the end of the episode, Chris's father admits that he only had the family celebrate Kwanzaa because it was cheaper. In order to make things right, his mother throws the family a Christmas a few days later, taking advantage of the after-Christmas sales to pick up a large assortment of presents for next to nothing. The two story lines dominating this episode concern Chris trying to celebrate the New Year in Times Square and his father becoming seen as a hero after talking down a suicide jumper. Chris has a hard time convincing his mother to let him go. She believes - as do several other characters - that it's an extremely dangerous place to be. Eventually, she relents with the stipulation that he needs to go with a responsible adult. The only one Chris can find who's going is the mother of his girlfriend. Unfortunately, she's an ex-con, so Chris's mother vetoes that plan. Eventually she relents after debating the matter with the girl's mother. If this had been any other sitcom, something bad would have happened. But the only issue they had was getting in, since the area was filled to capacity. Once there, he had a great time. Chris's father's plot had him appearing on the local news and talking far longer than the reporter wanted him to. Even so, he was viewed as a hero by everyone but his wife, who was furious he climbed up on the rafters of the bridge to convince the jumper it wasn't worth it. It was a good episode, clever and relateable, despite the over-the-top situations and characters. That holds true for all four episodes, in fact, though the series seemed to be at its best earlier on. As it went, it seemed to become more polished, a fact which took away a bit of its edge. But it was still good: every episode was better than most of the holiday sitcoms we see. Is It Really Christmas Already? What's This Under the Tree?